You will find no rest or welcome here, Bogatyr. A prophet is never welcome in his hometown. Ганьба! (Pronounced: Hańba.) This is the Ukrainian word for "shame" and it is the only possible expression that can be used in polite speech to describe the latest descent into madness of the self-destructive Ukrainian nationalist campaign against Russia. 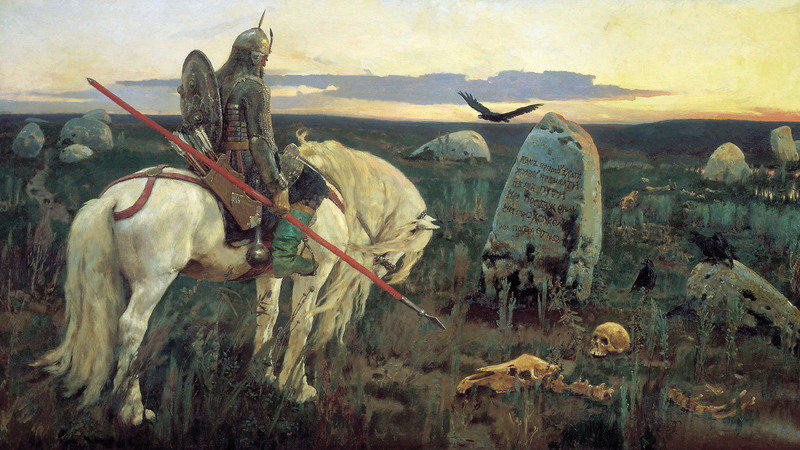 The latest victim is possibly one of the most famous Heroes of Kievan Rus', the Bogatyr Ilya Muromets. This legendary Hero of the Kievan Court; who's tale we have told in this article, was born in Murom Russia, though he was buried in Kiev Caves Lavra where he finished his life as a monk. The irony of this is that Ilya the warrior protected and fought for the heart of modern Ukraine, Kiev. To be fair, speaking the Saint’s name is not illegal in Ukraine, but all of the popular stories and Russian films about him are being assaulted by revisionist historians. They will likely claim they are removing "Russian propaganda" from the stories of "Ancient Ukraine". To be clear, there was no such entity called Ukraine in the days of Ilya Muromets; the proper term for the ancient territory of Ukraine is Kievan Rus', a term still used in Ukraine, but only as a synonym for Ukraine. Yet anyone with ears to hear can tell that this is the very word from which Russia takes its name. Above is a map of Modern Ukraine and below a map of Kievan Rus', note the differences. "He (Ilya Muromets) was a hero who, in fact, personified not only the military glory of Russia, but also personified the statehood of Kievan Russia, ancient Russia, Medieval Russia. And we can no longer define whether it's Ukraine or Moscow Russia, it all happened before that." "I could never imagine that such stupidity can occur in our time. After all, the ancient Russian bogatyrs are the characters that can’t be associated with any late East Slavic ethnic group. Back then, there were no Ukrainians, no Russians, no Belarusians, and there were ancient Ruthenians [Rus' people, the ancestors of Russians, Ukrainians, and Belarussians). These Russian bogatyrs are described in our epic history." Ilya Muromets lived at a time when there was no distinction between Ukrainian lands and (proper) Russian lands, therefore he cannot possibly be equated with anti-Ukrainism. This is all part of the broader witch hunt against any part of Ukrainian history. or literature which disagrees with the current narrative. For example, the works of Gogol, specifically Taras Bulba, once considered among the most archetypical depictions of Ukrainian Cossacks are now under heavy persecution. The attacks on Ilya Muromets takes this trend to a new level; it’s a pathetic political attack both on the history and spirituality that, no matter how you twist it, Russia and Ukraine share. Some more news from Ukraine. They have now forbidden the selling of fairy tale books about Russian bogatyrs that were published in our country. Among others, Ilya Muromets fell into disgrace. Zinaida Kurbatova tried to understand why the hero, who defended Kiev from invaders, doesn’t please the authorities. A bogatyr, hero of the most famous heroic epics, who became a monk and was ranked as a saint, Ilya Muromets defended the frontiers of ancient Russia from the evil infidels who wouldn’t leave the Orthodox alone. Calling him an aggressor is, at the very least a stretch. He’s a romantic hero. He never conquered anybody, and he left Kievan Russia only once. Andrey Vlasov, Russian Academy of Sciences Folklore Department Supervisor: "He was a hero who, in fact, personified not only the military glory of Russia, but also personified the statehood of Kievan Russia, ancient Russia, Medieval Russia. And we can no longer define whether it's Ukraine or Moscow Russia, it all happened before that." Ilya’s feats take place even before the era of the Tatar-Mongol. Ilya and his comrades, Dobrynya Nikitich and Alyosha Popovich, defended not individual princedoms, but the whole territory described in the Tale of Igor's Campaign. This is the documented territory of the Kievan Russian state, ancient Russia. Nikita Petrov, folklorist: "There’s a bogatyr who goes to Kiev, there’s the Kiev knyaz, Vladimir. There’s some struggle with the invaders. And the fight was against foreign invaders who clearly weren’t Orthodox, well, not even Slavic." Among the bogatyrs, Ilya, is of course the main one, and most of the epics are about him, more than a dozen, they’re known both in the north and in the south, where Ilya is also called the Old Cossack. Ilya’s enemies are robbers. The Nightingale fully justified his nickname, and from his nightingale whistling, I quote, "the dark woods bow to the ground, all the people lie dead." Ilya defeated the Nightingale and brought him to Knyaz Vladimir to be judged. Then, Ilya cuts the pagan monster’s head and then the Kalina the Tsar’s head. Both of them were besieging Kiev, that is, they were aggressors, and Ilya was the defender. There’s no other version. The story of Ilya Muromets’s origin is interesting. One version is that he was born and spent thirty-three years sitting on a stove in the village of Karacharov, near Murom. This is Vladimir's land. Here, in Murom, in the Transfiguration Monastery, are the relics of St. Ilya Muromets. Anna Gorskaya, Murom History Museum Deputy Director: "No chronicle knows the name of this hero. All that we have is only folklore sources. But it must be said that Russians and residents of the City of Murom, as early as in the 18th and 19th centuries, if we believe the descriptions of the City of Murom, historical works of our local ethnographers didn’t doubt that Ilya Muromets originated from the City of Murom." However, academician Rybakov, a recognized authority in this field, believed that Ilya could have been born in Moroviysk, near Chernigov. In Ukraine, history has long been rewritten. About ancient Ukrainians, and then about St. Sofia, which has a different chronology depending on the party line. Pyotr Tolochko, archeologist: "I could never imagine that such stupidity can occur in our time. After all, the ancient Russian bogatyrs are the characters that can’t be associated with any late East Slavic ethnic group. Back then, there were no Ukrainians, no Russians, no Belarusians, and there were ancient Ruthenians. These Russian bogatyrs are described in our epic history." At the same time, there’s a feeling that the writers don’t have too good a memory. A year ago, the Ukrainian Wikipedia noted that Ilya Muromets was a Ukrainian hero, who came from the Chernigov forests. In this case, the Ukrainians, who now decided to call Ilya the aggressor, punished themselves.